The iPhone wouldn’t be so amazing if it didn’t have all the bells and whistles. The iPhone comes equipped with fantastic resolution and sound, making it the perfect device for watching your favorite videos. Luckily, you can customize this experience as you see fit, including closed-captioning and subtitles. Look for the CC logo on media that you download to use this feature. Video you record won’t have this capability. Begin by tapping the Settings icon on the Home screen.The Settings menu will open and you will see your options. Tap General → Accessibility. On the screen that appears, scroll down and tap Subtitles & Captioning. On the menu that displays, tap the Closed Captions + SDH switch to turn on the feature. 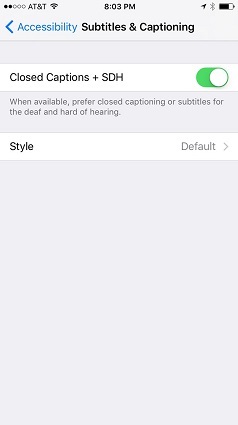 Now when you play a movie with closed-captioning, you can tap the Audio and Subtitles button to the left of the playback controls to manage these features.